Patrick Mahomes says he has spent a fair amount of time studying Tom Brady's approach. FOXBOROUGH, Mass. — Watching Patrick Mahomes this season has made Tom Brady feel like an old man. At least old enough to remember a much different era for young NFL quarterbacks. Now he looks around at a league in which Mahomes is one of several young quarterbacks in their first or second year starting for teams. Brady also started his second season, but it was hardly the plan as he replaced an injured first-stringer, Drew Bledsoe. 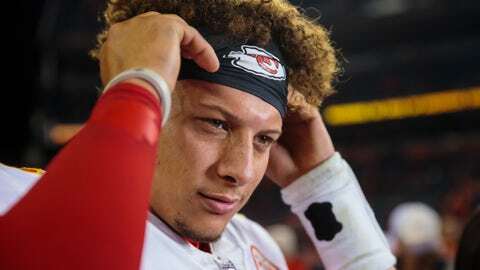 It’s an atmosphere that has allowed Mahomes, who will start for Kansas City when the Chiefs (5-0) visit New England (3-2) on Sunday night, to emerge as the most electrifying quarterback in the NFL this season. It has put the second-year Texas Tech product under the microscope in his first year as Kansas City’s full-time starter, following the offseason trade of Alex Smith to Washington. Despite Kansas City’s unblemished record, the Patriots enter Sunday’s game as a three-point favorite. It’s for good reason. Since 2001, 41 times a team has visited Foxborough with a better record than the Patriots. In those games, New England is 30-11. The Chiefs signed ex-Browns linebacker Nate Orchard and journeyman Frank Zombo to help with pass-rushing depth. Justin Houston has a hurt hamstring, and fellow pass rushers Dee Ford and Tanoh Kpassagnon have been banged up, which left only rookie Breeland Speaks available. The game features the two winningest active coaches in Bill Belichick (281) and Reid (199); Belichick is 5-2 lifetime against Reid.